INFJoe is the nom de cartoon of artist Aaron Caycedo-Kimura. Aaron drummed his way to the Juilliard School in New York City via the San Francisco Conservatory of Music. 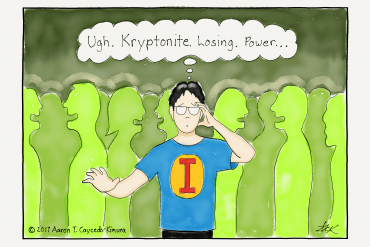 He created INFJoe during a creative rut in 2012 and discovered the incredibly receptive introvert community. He and his wife Luisa live in Connecticut, where they plan to birth as much art as possible. His book Text, Don’t Call: An Illustrated Guide to the Introverted Life is on sale now. 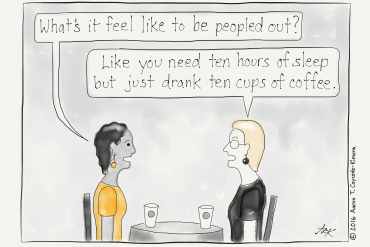 How do you survive a large social gathering if you’re an introvert? Here are four steps, with illustrations from my book Text, Don’t Call. Here are six things you might not know about us introverts, with illustrations from my book Text, Don’t Call.